While it’s week 2 of the The William Morris Project from Pancakes and French Fries, this is technically our first project. We started a week late, but that won’t stop us! 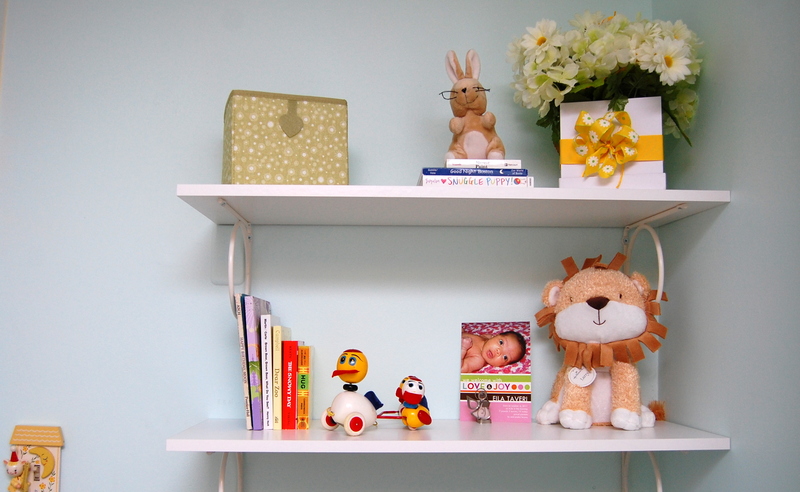 This week’s project was to add some shelving in Eila’s room. Her room has no closet and the more storage the better. 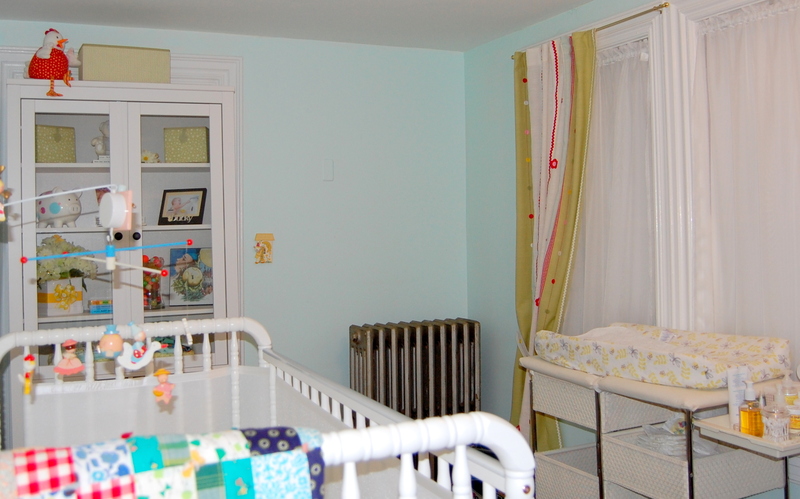 Eila’s room is long and narrow, I’m pretty sure it was originally an enclosed porch. There is only one long wall (where her crib is) and opposite that is an entire wall of windows (great for sunlight, bad for our heating bill). The far wall has a radiator and a door to our back hallway (which is being blocked by her cabinet), and the other small wall is just big enough to hold her dresser and still leave clearance for her door to open. The only logical place to add shelving was above the radiator. I apologize for the quality of this first picture. The battery on my Nikon was dead and I had to use my cell phone. I bought 2 Antonius shelves and 4 Ekby Kanna brackets from Ikea. I will not disclose how long these shelves were sitting on the floor next to Eila’s crib. It is embarrassing. It was a fairly simple process to get everything installed. Attach the brackets to the shelves, attach the shelves to the walls. But of course any project that requires symmetry or for something to be level on the walls always takes a bit longer as our 100+ year old house is quite crooked. This annoys my husband to no end, but he still keeps smiling. Since this was an easy project, please excuse my gratuitous use of pictures. I was so excited to finally have the shelves up that I immediately had to get some things up on them. I probably won’t leave it like this forever, but it was nice to play. I have a bunch of books from when I was little that I found during the purge at my mom’s and I’d like to put those on these shelves (Little Women, The Secret Garden, etc. ), but I forgot them in NY. Soon enough. I’m sure the space will evolve, especially as we complete all of the other little projects in this room. I thought about having the shelves lower and adding a third one, but I hope to make some sort of radiator cover and wanted to leave enough room so that it wouldn’t look to crowded. Well, that’s it for this week. I am going to link up at Jules’ weekly project and can’t wait to see what others have done! Your husband is so cute. And the shelves are great, too. So many people are organizing kids rooms this week! Makes me want to think about doing ours. Notice I said THINK. It’s too big of a mess to do much more. Ugh. Jules, thanks so much for stopping by my humble little home on the web! I’m so excited for this series, thank you so much for hosting it. My daughter is too small to make any type of mess in her room yet, I know I will be in trouble once she can! Hubby is cute, baby is cute, room is cute! You’ve got it made! Be still my heart…when you named the books that on going on the shelf! Classics. Lucky girl. Hope you will enjoy many peaceful moments reading them together. Thanks, May! My mom read those books with me, it will be so nice to continue the tradition. My husband gets annoyed too at how houses are never really symmetrical & straight…whether in our current house (only 13 years old!) or old house that was 50+ years old. 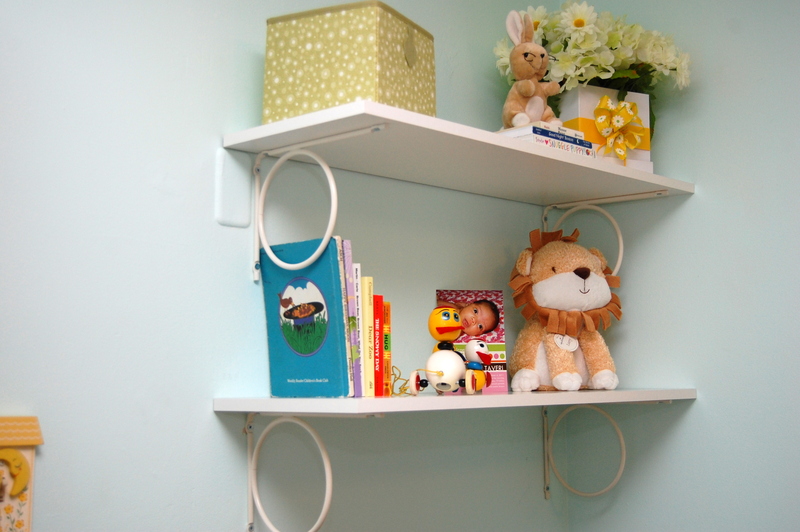 Your shelves look great, I love the circular brackets. Nice to “meet” you through the WM project! Same to you Kelly, thanks for stopping by! Ilove your nursery! Great colors! And your daughter is just adorable! Thanks Carla! So nice to “meet you” through the link up! Hi, stopping by from Jules’ link up. What a lovely family you have and the nursery is too cute. Love the circle brackets! I see you have Dear Zoo, that was one of my son’s favorites. Thanks Monica. We love Dear Zoo, too! 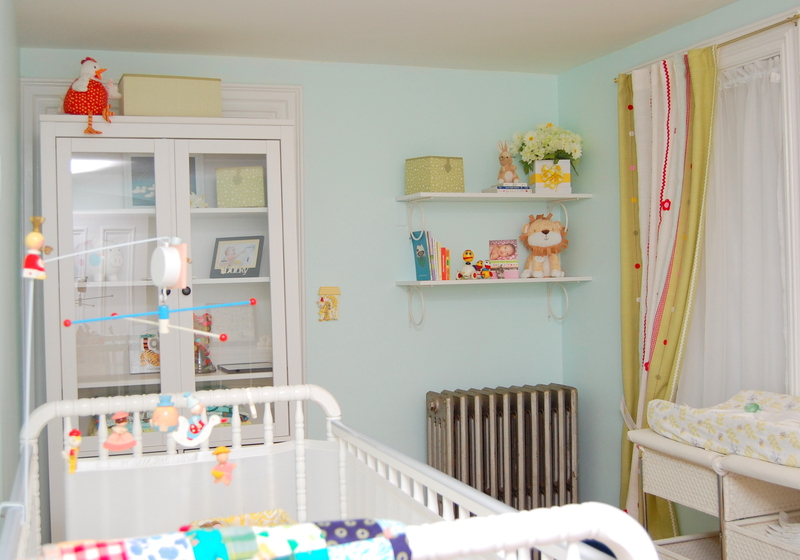 Eila’s room is adorable! I love the bright, cheery colours that you chose and that it’s not overtly girly! The shelves look great. Thanks! We didn’t find out the baby’s gender but I just knew it was a girl. I’ve never been a big fan of pink and frills, myself. It looks so great! I love the colors too! So cute! I can’t wait to decorate the next nursery! And thanks so much for your detailed response to my stroller question! SO HELPFUL! Thanks so much! Glad the info was helpful and not annoying, can’t wait to hear what you decide to do!